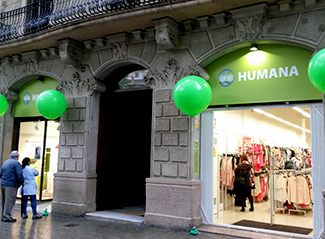 Humana today opens new sustainable fashion store in Barcelona Ronda Sant Antoni, 45, almost 30 years after his first inauguration. The new facility, located next to the Moritz Factory, has 400 square meters of surface. As a novelty, it includes a large section kidswear, with more than 2,000 items, and an area with vintage clothing and footwear. This secondhand clothing reinforces the supply of sustainable fashion in Barcelona, ? ?since it is the 16th shop of the Foundation in the city. The opening is special because it happens at the gates to celebrate the 30 years of the first secondhand Humana store in Catalonia, opened 1987 in Santa Coloma de Gramenet. The secondhand fashion offer has increased in Catalonia in recent years, which is explained by several reasons: affordable prices, the interest in vintage and sustainable fashion itself, and consolidation of values ? ?such as responsible consumption or social conscience. In 2015, the number of customers of the Humana shops in Barcelona amounted to 495,000 people, 16% more than the previous year. Through its network of stores, Humana promotes the second life of clothing as a pillar of sustainable fashion and encourages responsible consumption because there is no more sustainable than the already manufactured part, it helps to protect the environment and generates funds for cooperation and community support programs.